In 2011 I had finished three years work on a series of paintings showing a year in the life of the Magnolia x soulangeana. The series was exhibited at the RHS that year and I won a Silver medal – my first RHS medal. One of the paintings was chosen by the Hunt Institute for Botanical documentation in Pittsburgh, USA and it was first exhibited there in 2013. Since then it has had a three-year tour around the USA with the rest of that exhibition, but is now back in their archives in Pittsburgh. I was super lucky to have some huge fruit on the tree the years I was doing the paintings and they were featured. But since then tree from which all the paintings were done, has not produced much fruit at all; in fact nothing until last year when it had a couple of small ones. I think the tree knew that I was painting it’s portrait and wanted to show itself at its most beautiful. I am hoping that the tree is building itself up to another magnificent display later on this month. At the moment there are masses of terminal buds in which the blooms develop and you can almost see them growing a little more for each day. 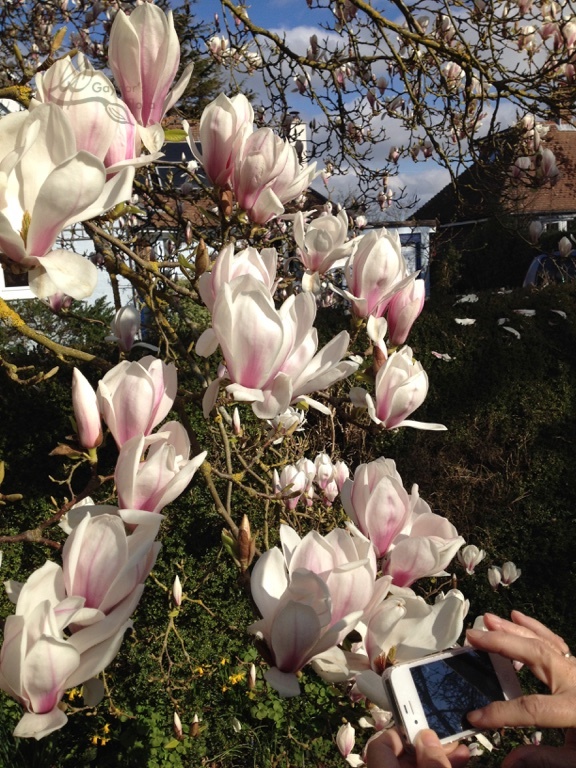 It is obvious that the Magnolia tree means quite a lot to me after having studied it so closely for those three years. I learnt such a lot about it, how it is fertilised and why it is a particular type of bug that is responsible. 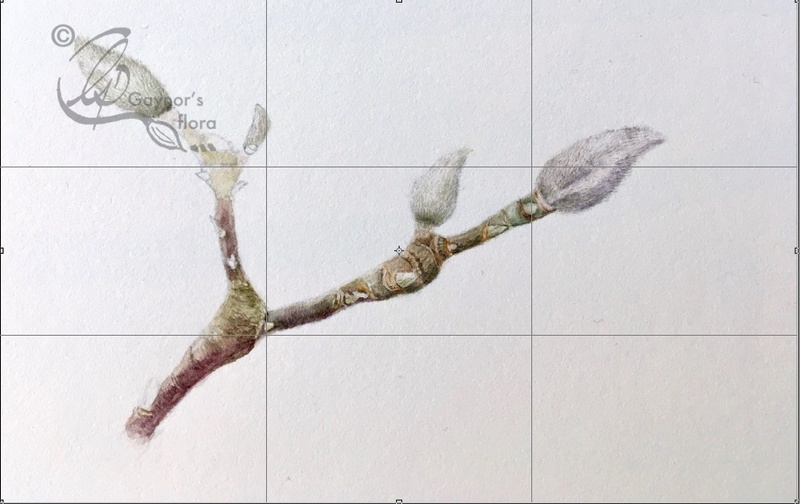 If you want to know more about Magnolia x soulangeana, and you are interested in botanical art as an artist, do book to come to my workshop Friday to Sunday 31 March to 2 April. I still have a few places available. This is the first time that I have had a workshop on this subject – and you can probably guess why. But now I would love to help others who would like to paint the blooms in watercolour or coloured pencil (dry), or even draw them in graphite. Get in touch with me as soon as you can so that you don’t lose this opportunity. Tomorrow two of us are travelling up to London to set up the ABBA table in the RHS Lindley Hall, Vincent Square near Victoria Station. It will be the RHS botanical art show with the best of International botanical artists showing their work. Neither of us are exhibiting our own work this time, but we will be demonstrating different techniques. On Friday and Saturday this week, I have chosen to demonstrate a sketch book or study page in graphite and watercolour from one of the native plants I have packed to take with me. Come along and see how I do this. 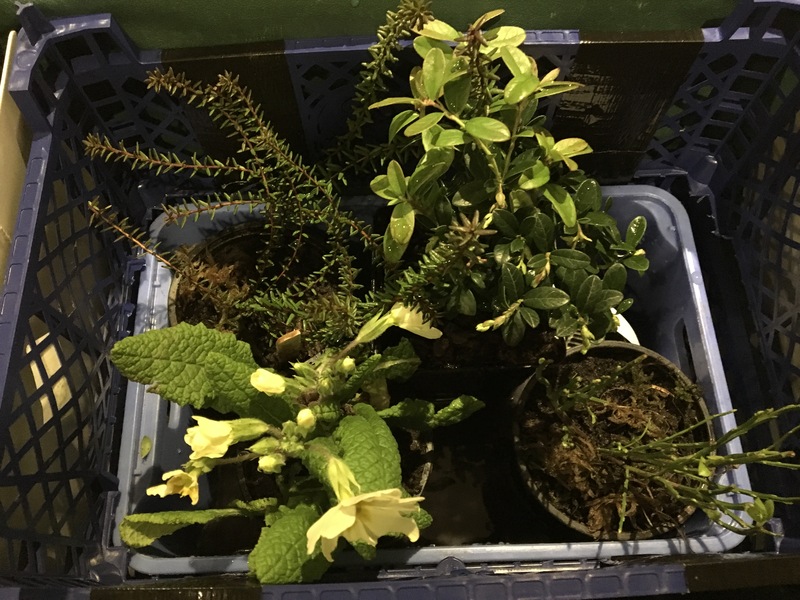 Apart from the Primrose, do you know what these plants are called? The one on the right, with hardly any leaves just yet, is a Bilberry. This is a small wild blue berry. It doesn’ look very interesting at the moment, but if you are going to paint the portrait of a plant, including something from various stages in its life cycle, makes the resulting picture more interesting. The plant above the Bilberry with the small oval leaves is Cowberry and has small red berries. You might know it as Lignonberry and has smaller and sharper tasting berries than cranberries. This plant has the beginnings of tiny flower buds. 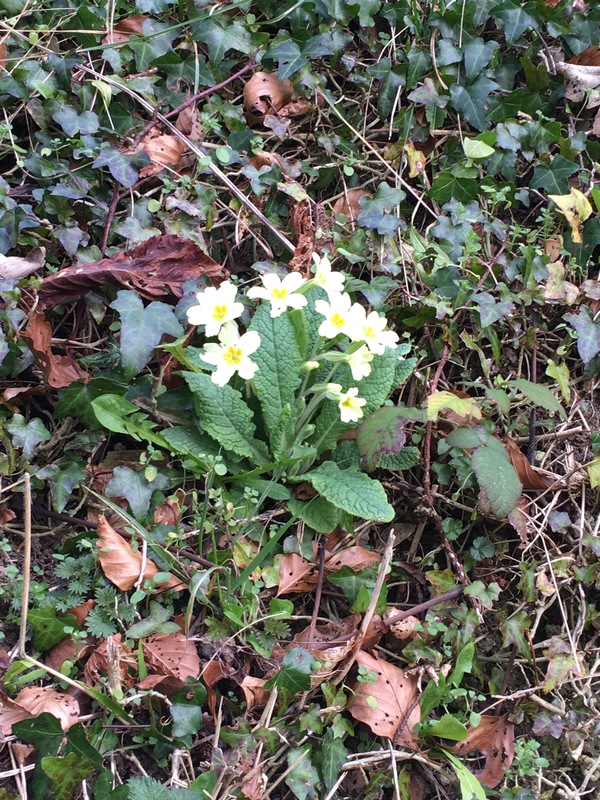 The one above the Primrose is a Crowberry and will eventually have small, almost black berries. Again the plant doesn’t seem so interesting in this stage of its life, but I think might offer some challenges whilst painting its portrait. 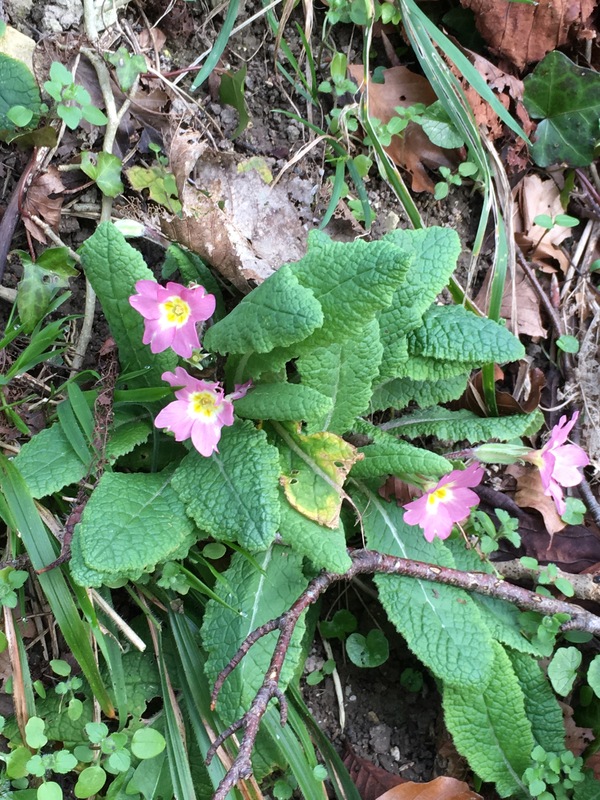 Common for for all three species ( not the Primrose) is that they all produce fruit that is edible. 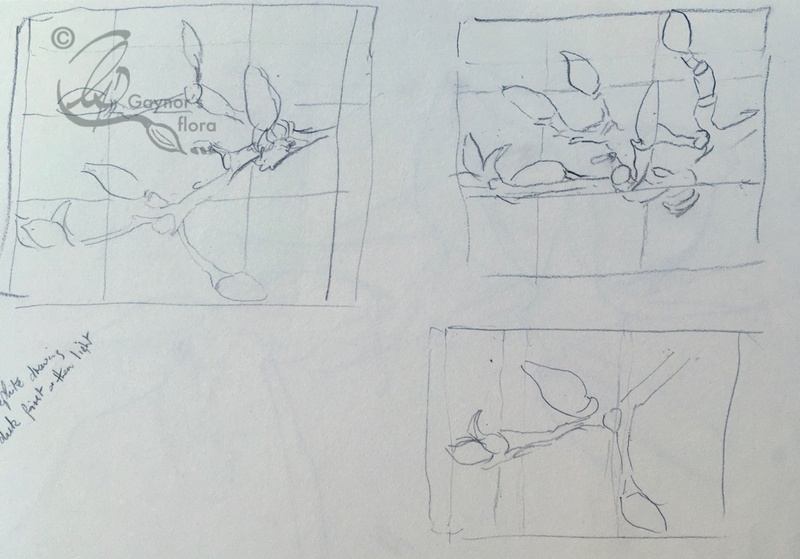 I am lucky enough to be able to do some sketches now, while the plants are only just coming out of their winter state. This will be particularly useful for me and for future work I have planned. Do come and see us at the RHS, Lindley Hall, Vincent Square, Friday and Saturday. Now I know what the Seven Sisters are! We have just got back from long, tiring hike, with a lot of steep hills. 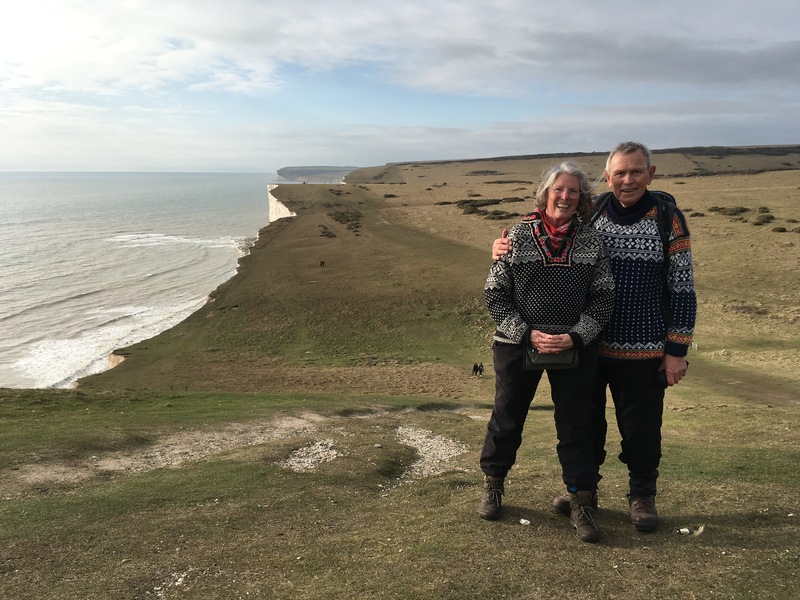 We started near Cuckmere Haven, went up through the Friston Forest and then down to the Birling Gap, going along the cliff path in the Seven Sisters Park back to Cuckmere. I generally write about something pertaining to botanical art and this is no different. 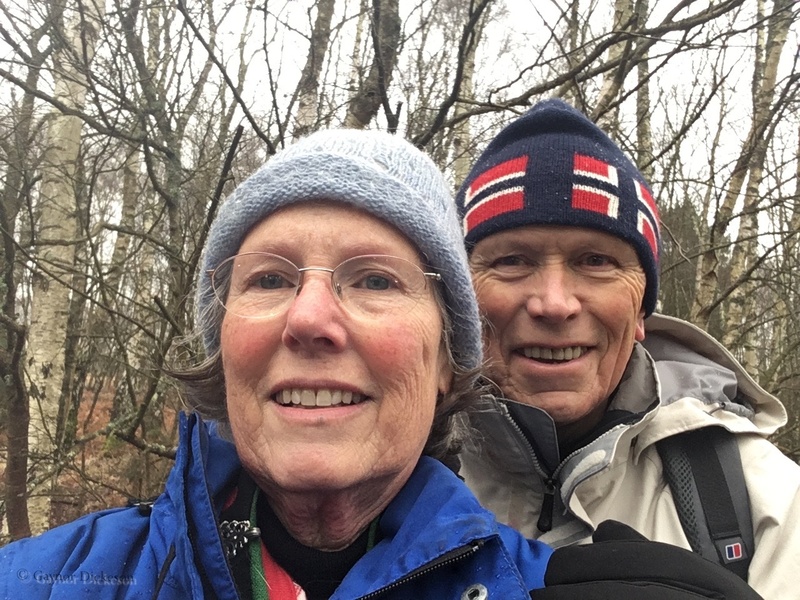 But if one is able to get around – and I recognise that not everyone can do so, getting out into nature to look at the subjects it provides for us is exciting. Unfortunately not everyone does have the ability to get around and hopefully my blog can bring some of what I experience to those people. I have spoken a lot about native flora of late and of course that is because I am involved in the ABBA team that is putting the UK on the International Botanical Art map in May 2018. I, like many other botanical artists have always painted or drawn the plants that do something for me, no matter where those plants have originated. The topic of the Worldwide exhibition is ‘Native plants’, therefore I have looked long and hard at the pictures I have painted before and those I want to paint in the future. There are so many plants that are considered native and often they are right outside our back doors. But they can also be quite stunning. 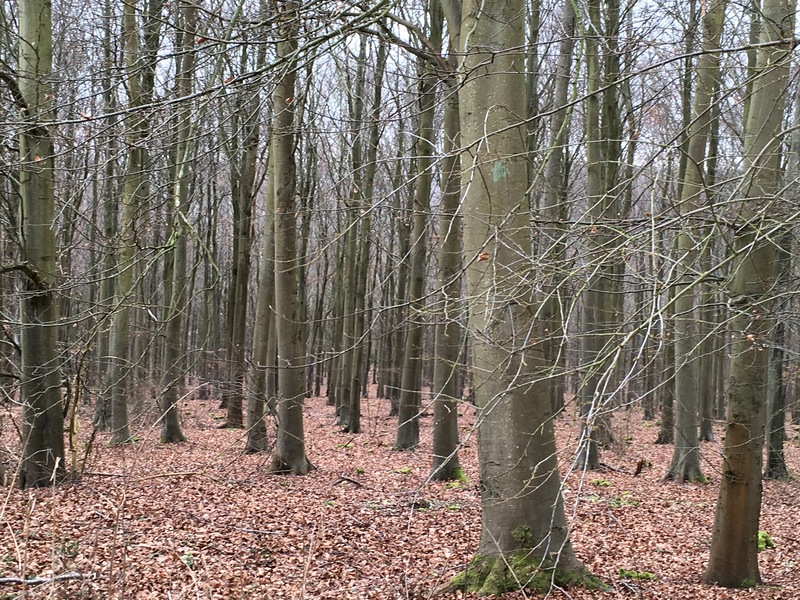 Back to the Seven Sisters and Friston woods where we saw this lovely forest of Beech trees. and some stiles! Not good for us old people. Bear in mind Robin is just older than me (although he hides it well), but it is me that struggles so much with these contraptions. I can walk for miles over rough terrain, up and down. 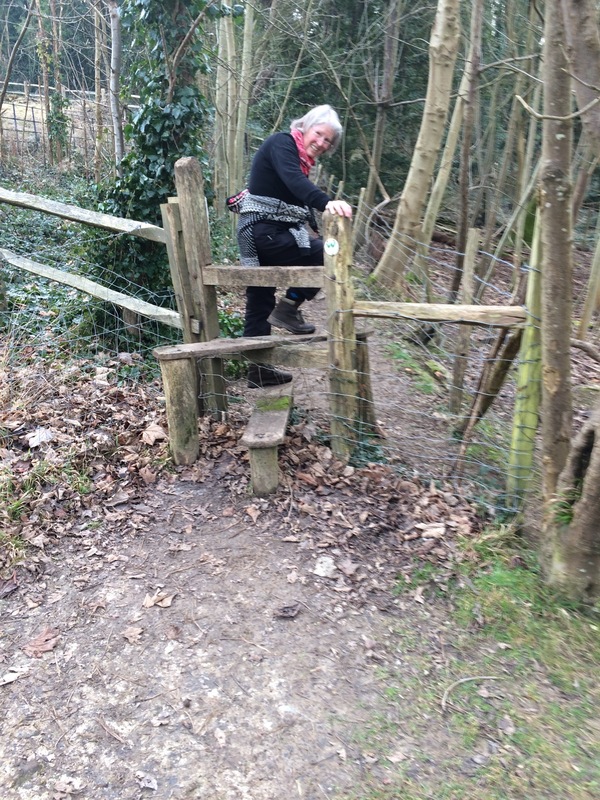 But climbing a stile gets me. I think those stiles will get me before walking a long distance does. 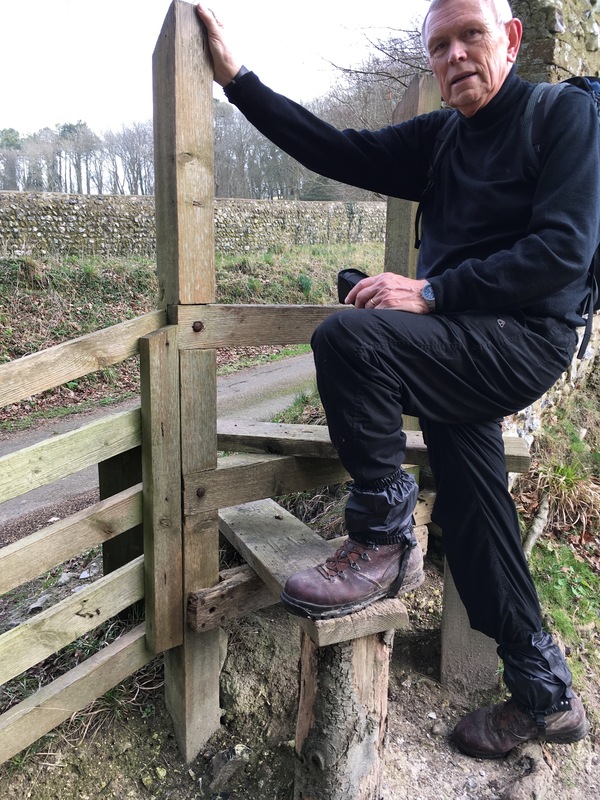 I am so glad when I see a gate that can be opened, and would happily hang over an edge to get round a post rather than over the stile that might be inbetween. Not to mention some of the stiles that are so rotten, that they are dangerous. None were today. We had tea and cake, outside at the Birling Gap. I only mention that to show the difference in the weather over one week. Last week it was bitter cold, but today was quite pleasant if one kept walking. 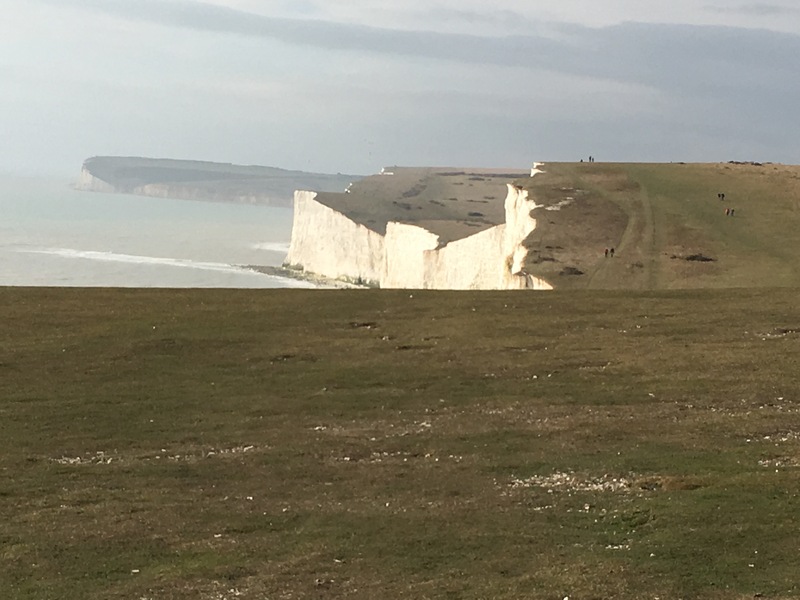 The Seven Sisters is a series of chalk cliffs that rival Beachy Head (the White cliffs of Dover). Part of the South Downs Way runs along the cliff top, which goes up and down seven times. In fact, I thought I counted eight, but by the time I got to Cuckmere Haven, I was past caring. Along this stretch there was a lot of flowering gorse. Pictures do show a little of the beauty up there. A very good three-day botanical art workshop. Following loads of preparation, ABBA (the new Association of British Botanical Artists) launched its new website on Wednesday and I had one of my workshops on Thursday, Friday and Saturday. The steering group for the new organisation put in a lot of work up until the launch of information about the Worldwide Botanical Art day in May 2018. For more information look at the website: Www.abba2018.wordpress.com. We have had a lot of very positive feedback and quite a few botanical artists have already started thinking about a species of plant they want to paint. The botanical art workshop concentrated on painting pale flowers on white paper. My students were extremely brave and worked on the sort of thing a lot of people fear doing – painting white flowers on white paper. They actually chose to do this, although I suggested they could work with any pale flower. Here are a couple of the results. One in watercolour and one in coloured pencil. The trick is to try and paint your pale flower with a background of darker colour – leaves or a dark flower. I was extremely pleased with the results, as were they. Tomorrow we are going for our long walk to build up for long days at the end of the week when we will be at the RHS exhibition in London. 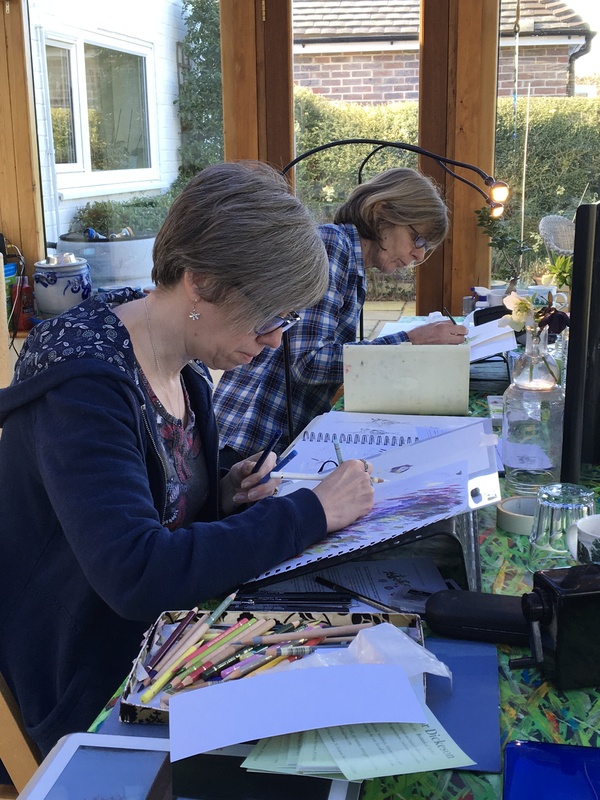 Sarah Morrish and I will be there for both Friday and Saturday, demonstrating and giving out information about the Worldwide botanical art day. Lucy Smith will be joining us for one of the days and the intention is for us to use different methods of drawing or painting native plants. Does anyone know what this is and is it native? I hope you now have an idea as to why I have been focusing on native plants recently? For those who are still not aware, we have formed a new organisation for all UK botanical artists whether they belong to an organisation or not. It is called ABBA, the Association of British Botanical Artists, although slightly a misnomer as this also includes Norther Ireland. Why was this started? Well, the American Society of Botanical Artists (ASBA) initiated a worldwide botanical art day for May 2018, inviting all nations to to join them in organising a botanical art exhibition in each country. Some of us felt it particularly important that the UK was represented because we have some brilliant botanical artists here. Some of them remain independent and have no allegiance to any organisation. Therefore having an association inviting everyone, was the answer. But, today during my latest workshop, I was looking through my sketchbook and found the following drawing. I know that I did it through a microscope at an Institute of Analytical Plant Illustrators (IAPI) meeting, about mosses and liverworts. The problem is I was stupid enough not to write what it was. Can anyone help me, and is it native to the UK? I have a strong suspicion that this is a Bryophyte capsule, but of course it doesn’t tell me which one and therefore I don’t know if it native. 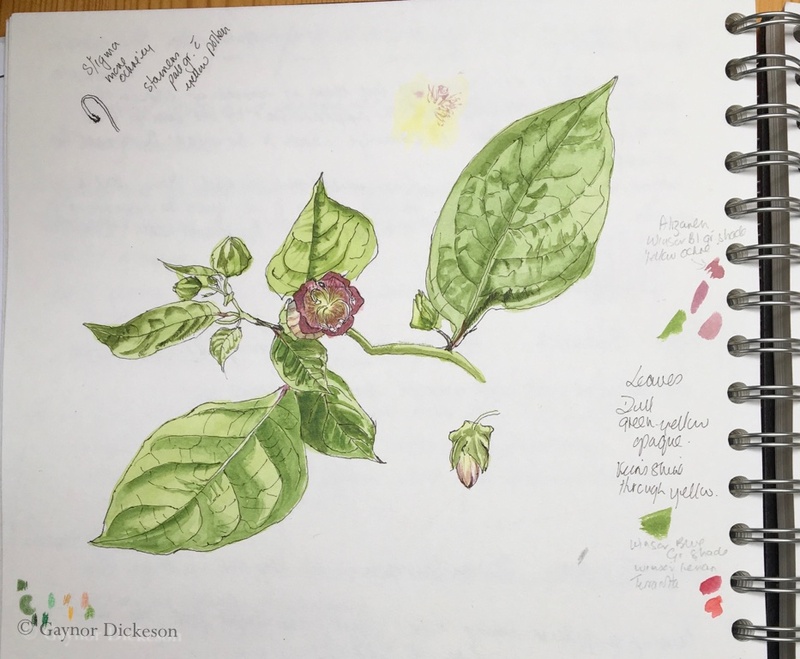 My next sketch is native and is Deadly Nightshade (Atropa belladonna). I think this is a really beautiful plant, although, if walking past it the colours of the flowers are rather dull. But of course the plant is often seen with flowers and large, shiny black berries at the same time. One day I hope to paint it, but I will have to be careful with it. Atropa Belladonna – Deadly Nightshade. Next week, 24 and 25 February, ABBA will have a table at the RHS botanical art exhibition in the Lindley Hall, Vincent Square, London. We are there to tell you about the exhibition in May 2018 and how you can take part. Additionally, over the two days, Sarah Morrish will be demonstrating on Vellum, Lucy Smith in pen and ink, and I will be doing a graphite and watercolour worksheet. Please make yourself known when you visit us. Gradually I am building up to something! So what can that be? Of late I and several others have been very busy with a project that has kept us from painting as much as we would like to. But it hasn’t prevented us completely from spending some time with pencils or brushes in our hands. You will find out about it soon enough, when we have done enough preparation work to tell you all about it. Another thing that the project doesn’t prevent us from doing is looking. Many people think that because it is winter, cold and bitter outside, that plants aren’t growing, or that they are hidden away. They can’t imagine that there are some beautiful flowers out, even at this time. But, if they use their eyes, they will see so many lovely things in the gardens and the hedgerows. Some blooming, some dying or dead, but have taken on a beauty all their own. Bare branches are an absolute treat with so many colours and textures now visible. A lot of plants that are poking through the soil at the moment are not native to this country, such as Tulips. Many plants seem to belong here because they are commonplace in all our gardens, but many were imported at one time or another and therefore are not indigenous. As I live in the UK, of course I am focusing more on plants that are common here. Other countries further south, but not so positively affected by the Gulf Stream, may well have their gardens still buried in snow and don’t see the beauty that is lurking under this warm blanket. However there is still beauty in evergreen trees, or in deciduous trees with their growing tips and buds change from day to day. At the weekend, we were on a hike and I mentioned the snowdrops. But we also saw a lot of Gorse that was flowering. The plant is of course dangerously spikey, but the flowers are a striking yellow and seem to withstand all sorts of temperature thrown at it. Gorse (Ulex)is a native species in the UK. 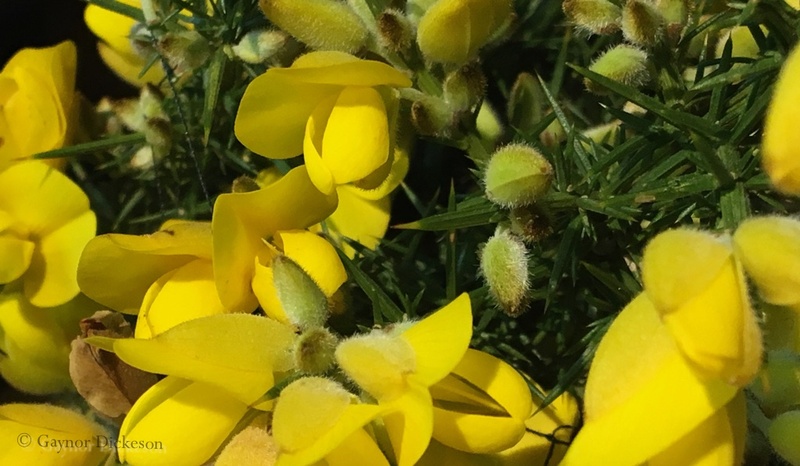 Gorse (Ulex), a native species to the UK. Hiking amongst UK native plants in the snow! What a lovely day today was, although bitter cold and snowing! But I wanted to make the most of it as it was probably one of my last really relaxing days – if strenuous, for a couple of weeks. The sun didn’t shine, the sky was heavy, a cold damp breeze was blowing and the sky started releasing its load in the form of snow as soon as we started walking. The weather forecast had said ‘cloudy’, but dry! Luckily we chose not to do any of our hikes up on the South Downs Way. Where we were the snow didn’t settle, but the South Downs were obliterated. The phrase ‘There is no such think as bad weather, just bad clothes’ has been attributed to many people including Alfred Wainwright. But Norwegians are actually brought up with this phrase as small children – with their skis of course! Robin and I were well and truly appropriately dressed from our wool long-johns and base layers, to the additional wool layers on top. ‘Snug as a bug in a rug’ is also a good phrase, but our layers allowed us good movement. Dressed to kill – the cold! We started out at Elsted Marsh and did a 12 km circular walk taking in the Iping and Stedham Commons. What a super walk! 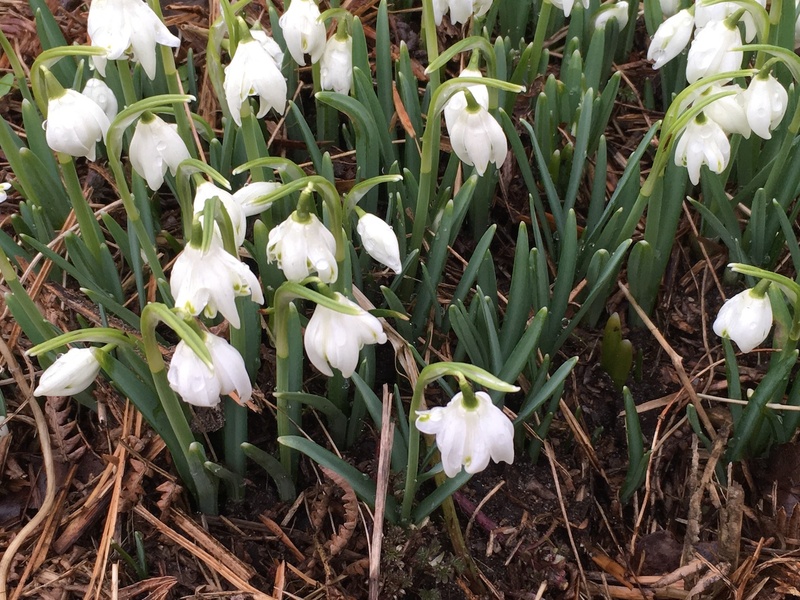 We saw drifts of Snowdrops – Galanthus. Do you realise that they are a native species? This is important to know if you are a botanical artist and over the next couple of weeks you will read about other plants available at the moment that are native to the UK. Back to the Iping and Stedham Commons; they are well managed and they try to keep on top of the amount of Bracken (Pteridium aquilinum) that grows there so that it doesn’t take over from the heathers (Erica) and the Gorse (Ulex europaeus). All of these plants are native to the UK. We also saw two Dartford Warblers. 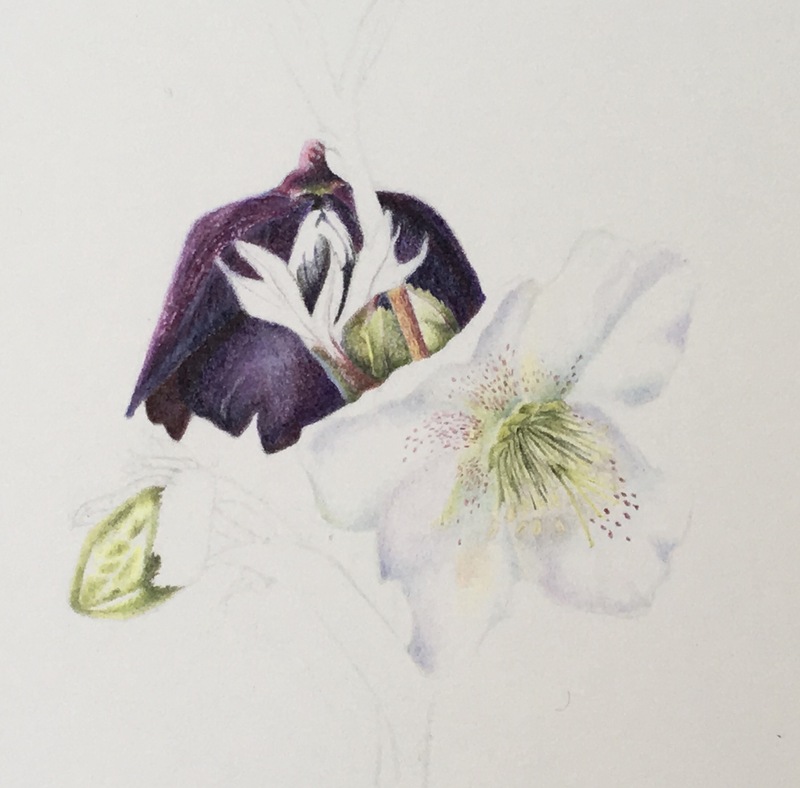 Completed from the last botanical art workshop; when is the next? I thought that it would be pleasing to show one picture started in the last workshop, completed. Sue James sent me this message and gave her permission to use use her name and her image. ‘Finished article! Thanks for a great workshop, learned a lot! Looking forward to the next one’. I am sure that you will like it as much as I do. 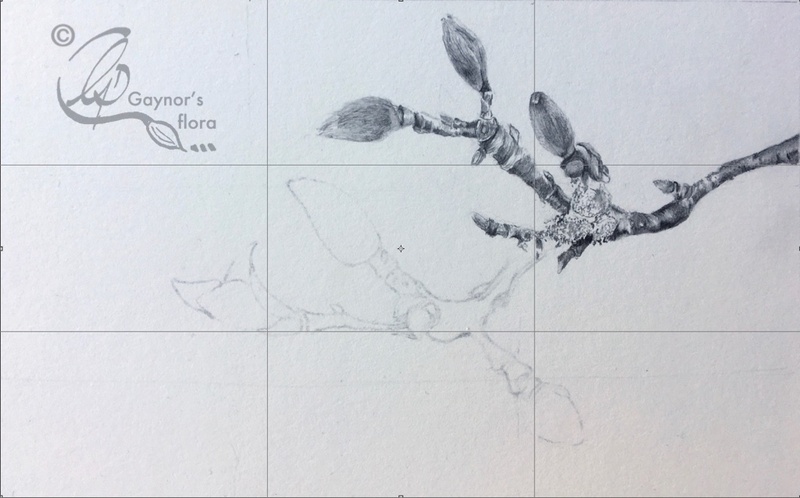 Painting the hairy buds of the Magnolia x solangeana in the technique that I use is not easy although it gives the best result. I think you will agree with me that she has achieved this very well. 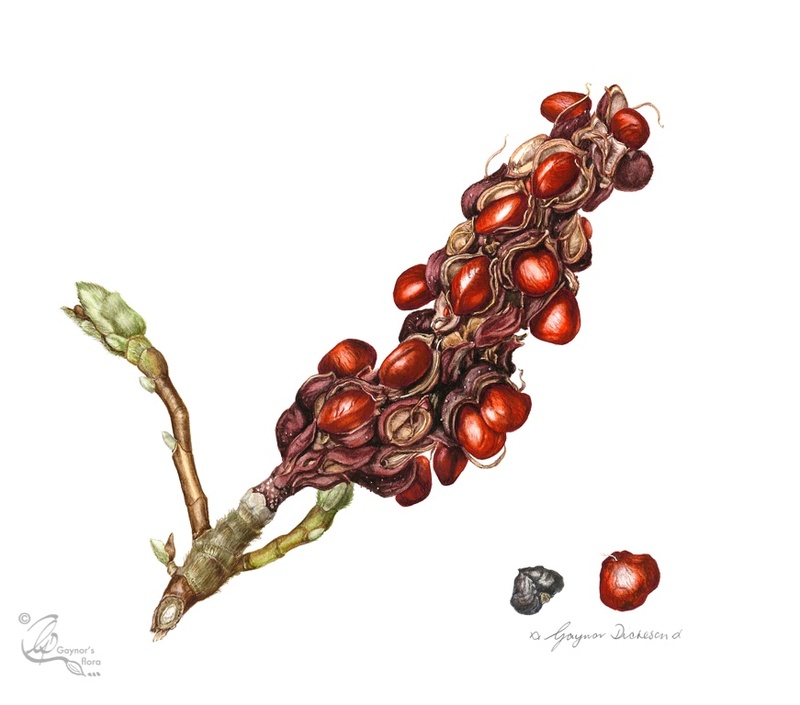 and the online botanical art course https://gaynorsflora.com/tuition-2/online-botanical-art-course/. Because I limit the number of students at each workshop I teach in watercolour, coloured pencil and or graphite. 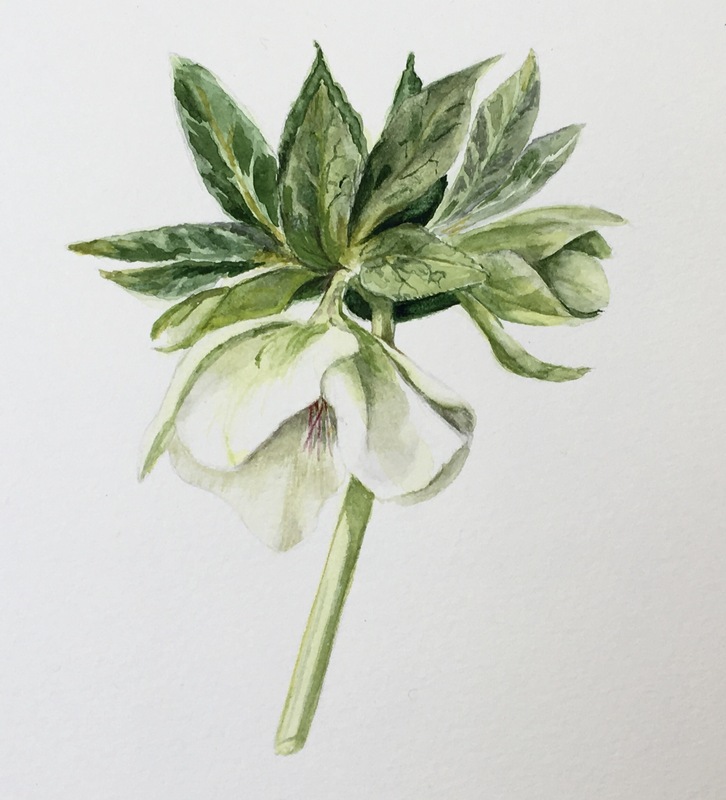 The next botanical art workshop in Bosham is ‘White flowers against dark ones’, although in reality the topic is really about what is to be gained by painting pale flowers against something darker in the background; leaves or darker flowers. The workshop is Thursday, Friday and Saturday 16 – 18 February and there are still a very few places available. The workshop holiday at Le Manoir in the French Dordogne has only four painting places left, so if you want to come, sign up for this soon. Take advantage of being looked after from the botanical art point of view, and in relation to the holiday with well thought out afternoon trips and of course looking after your taste buds. 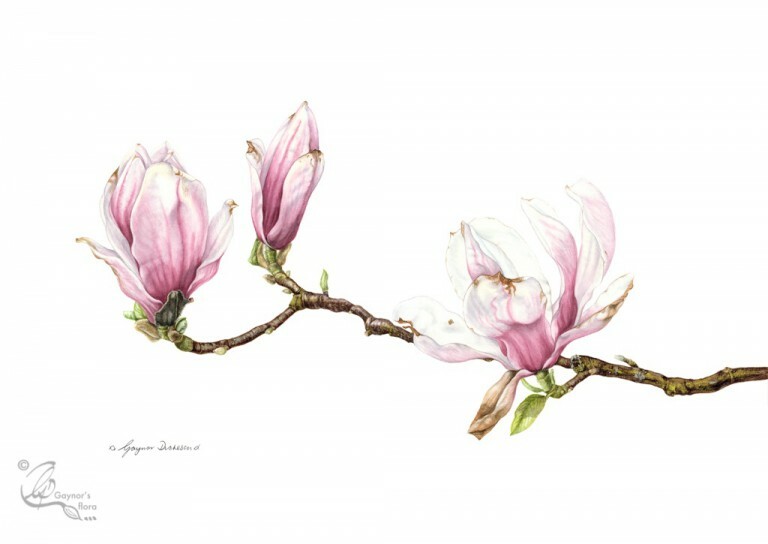 Last, but not least is the ongoing Online Botanical art course. Unlike many other online botanical art courses, this one takes a limited number of new students each month and is therefore continuous. It is spread over a longer period of time (18 months), allowing you to fit it in with your other commitments and life in general. Additionally, you can get in touch with me with any queries you have about the course at any time; you can communicate with other students participating in the course via a secret Facebook page; the feedback you get for each of your assignments is a several page long very detailed constructive critique about each of the pieces you send to me. I take on new students for February 1 tomorrow, and again 15 February. Get in touch. It may be grey out there just now, but there is so much already in the garden (in the Northern hemisphere), just ready and waiting to explode. Down under, it is probably the hottest part of the year, but it is always exciting for me to see the subjects chosen to paint, which might be considered exotic in the UK. Oh how I love doing what I do! I am sooo-o chuffed after this weekend’s workshop! Yesterday and today was the first botanical art workshop of the year in Bosham. What do you paint in the wintery months? There are loads of interesting subjects in the hedgerows. The title of this workshop was textures and as usual I tried to make suggestions as to what these may be. My workshops have a limited number of participants so that everyone gets help where they need it. This time people brought catkins, bark, ash keys, pine cones, algae and magnolia buds. I also brought in some lambs ears (leaves) and sticky buds (horse chestnut). There was an ample supply of everything and people worked in coloured pencil, or watercolour, or graphite. My workshops always begin with a little about composition; a subject everyone seems to be scared of, and drawing. Everyone always wants to jump straight into the painting, but of course the final painting is never better than the planning that has gone into it. 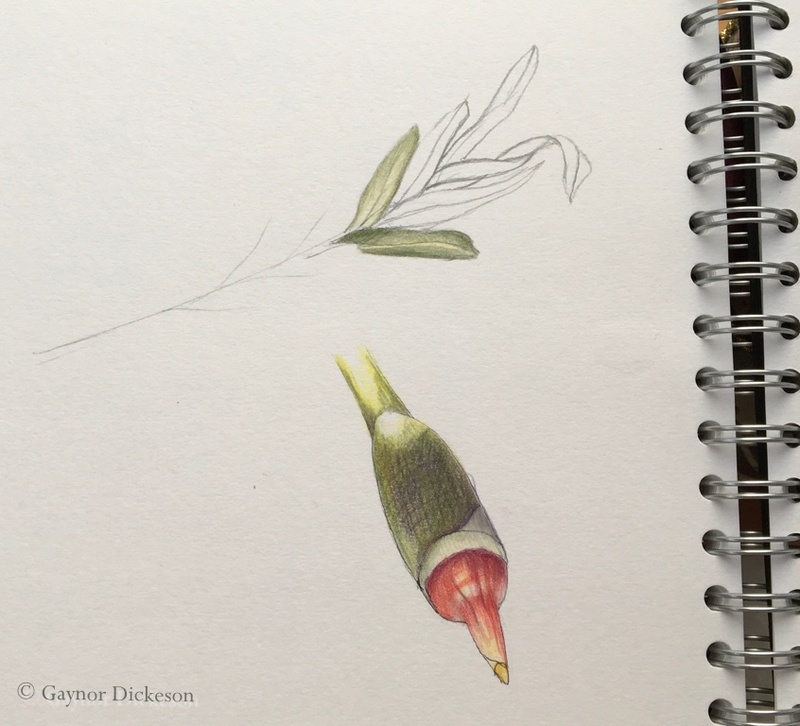 This time, as I knew everyone from previous workshops (normally there is at least one new person), they felt it was OK for me to concentrate more than usual on the compositional aspect of botanical art. They duly did their thumbnails and decided which one they would focus on to create their line drawing. 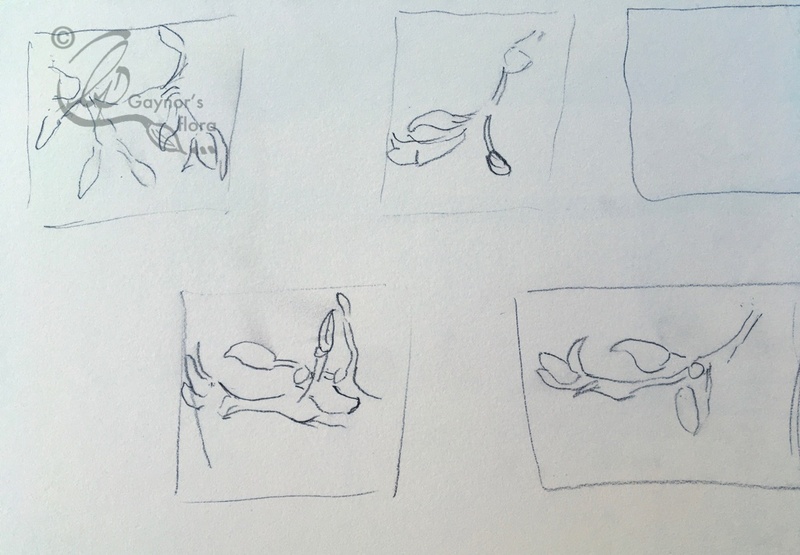 I am going to show you the progress of one student from thumbnails to where she got to today. We talked a lot about the Golden section, rule of thirds, diagonals and ignoring the lot! Of course we mustn’t forget that the workshop was also about textures, so I demonstrated different techniques in all three media. Of course they found that the furry buds were the most difficult, but everyone persevered and got some amazing results. So finally, why am I so chuffed? Well, those who chose to do the Magnolia buds in watercolour, actually mastered the dry-ish brush technique that I use. Many do give up on this because the issue is the water/pigment mix, and taking care of brushes and picture at the same time. But I think the part giving me the biggest thrill were the compositions. I have superimposed two of the pictures with the three-by-three golden section divisions that help to find where the focal point is best placed. The eye was drawn in particular to these two pictures in main because of their composition, but also their fluffy buds. Remember they are half finished, but they just show how a well planned composition can have a good effect on completing a picture. Do you agree? Magnolia x soulageana terminal buds in graphite. 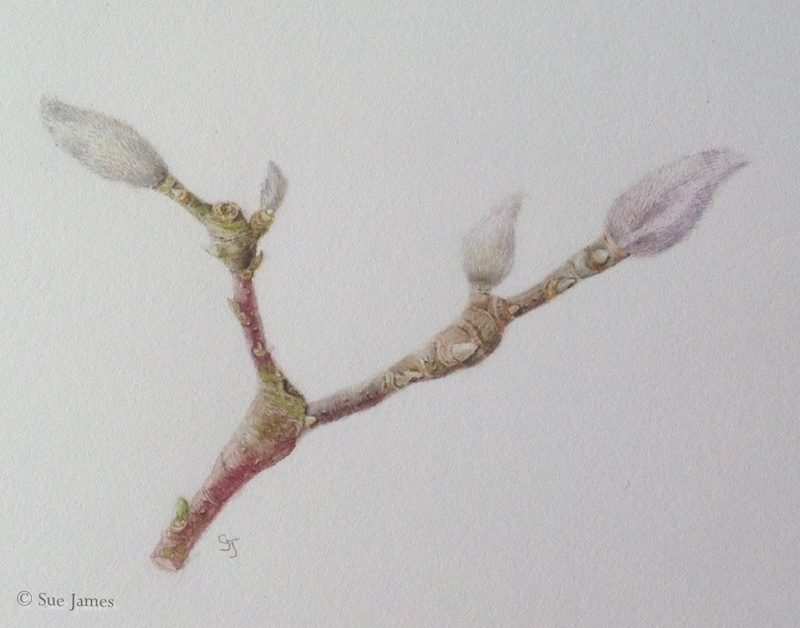 Magnolia x soulageana terminal buds in watercolour.